Riviera Nayarit Mexico Blog: The most spectacular beaches of the Riviera Nayarit! The most spectacular beaches of the Riviera Nayarit! Here you’ll find everything from virgin beaches where turtles nest and secluded island shores to shallow waters for children and high-octane waves for the most seasoned of surfers, who can enjoy hanging ten all year long. Bahía de Banderas, Compostela, San Blas, Santiago Ixcuintla and Tecuala: five municipalities that make up the Riviera Nayarit. And this is where you’ll find over 30 beaches—indeed, there’s something for everyone! 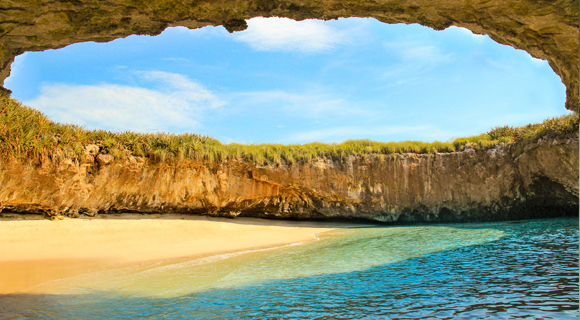 The most spectacular is Playa Escondida (Hidden Beach), also known as Playa del Amor (Love Beach), tucked away inside one of the Islas Marietas. Then there’s the longest beach in Mexico, second longest in Latin America, third in the Americas and sixth in the world is Novillero, located in Tecuala and gorgeous at 56 miles (90 kilometers) in length. Every surfer dreams about year-round waves—it’s a dream that comes true in the Riviera Nayarit. The most powerful wave, the Stoner Point Break in San Blas, is only around in the summer, but there are lots more. The most popular is in Sayulita, where thousands of people learn to stand on a board for the very first time. There’s another that’s over half a mile (1 kilometer) long—in fact, for years it was the longest one in the Guinness Book of World Records. This wave originates in Las Islitas and travels the length of Matanchén Bay in San Blas. For the past few years the Riviera Nayarit has had the most Certified Clean Beaches in Mexico. It’s also home to Nuevo Vallarta Norte, accredited with the Blue Flag international certificate. There are small bays in the Riviera Nayarit that shelter swimmers as well as open sea, which provokes those stronger waves. This is why, there are many other sports you can enjoy besides surfing, including stand up paddle, kayaking, jet surfing, fly boarding and kite surfing, among others. Then again, can hang out on a beach in Punta de Mita or Flamingos steps from a hotel with every service at your beck and call, or, you can choose to put your camping gear to good use and fall asleep under the moon to the sound of mermaids splashing and the murmurs of the jungle. The choice is yours.